Ear plugs for shooting have been evolving at a rapid pace, and today, we are proud to offer a the best selection of shooting ear plugs you will find anywhere. Foam ear plugs offer basic protection; they muffle all sounds around you, but high NRR foam ear plugs offer great ear protection and are inexpensive. 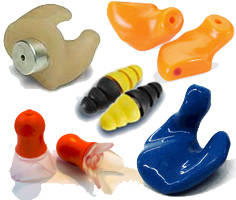 Moldable ear plugs are similar: they provide passive protection, good comfort, and a small price tag. Reusable Shooting Ear Plugs are the next step up. Many of these plugs feature acoustic filters, which provide sound blocking plus an acoustic filter that still lets safe sound through. Shooting ear plugs with acoustic filters are designed to let you hear safe sounds and maintain situational awareness while still protecting you from dangerous gunshot noises. Finally, our top-shelf solutions for hunting/shooting hearing protection include electronic ear plugs and professional lab full custom molded shooter's ear plugs, both of which provide vastly superior protection for truly serious hunters and shooters. Shooting ear plugs included in this department are those specifically labeled for use by shooting enthusiasts. These ear plugs include some disposable foam ear plugs, some reusable silicone ear plugs, some moldable silicone putty ear plugs, a number of ear plugs with acoustic filters in them that let you hear low sounds and then automatically provide stronger hearing protection when a dangerously loud sound arrives at your ear. Custom molded ear plugs for shooting provide the very best fit you can get from an ear plug, because each pair is custom made to exactly fit your ears. Custom shooting ear plugs are also extremely comfortable, and are ideal for wearing for long hours at a time. Another advantage of full custom ear plugs for shooting is that these are the most durable ear plugs you can get; one pair can last for years. Hunting hearing aids are available in behind the ear or in the canal models. These devices amplify sound so you can hear better, but they automatically limit the volume to a safe level when a dangerously loud sound comes in contact. Many people also use hunting hearing aids to help them hear better in their daily lives. Hunting hearing aids are an economical alternative to professional hearing aids for those with mild to moderate hearing loss.